Bangkok has some really good Vietnamese spots spread around town and I’m happy to tip those of you loving an excellent Banh Mi. I really enjoy a good banh mi myself, especially on the go or for a quick sit down lunchtime. Quick should not be read as quality is less important. Quality is always important, and that is also what you’re served by Bo and Richie at Banh Mi Bo in the Phrom Phong area. Banh Mi Bo was known for driving around in their green Vietnamese sandwich truck but have no settled down at Sukhumvit 762/2 (between Sukhumvit Soi 30/1 and Soi 32). Banh mi is derived from bánh (meaning bread) and mì (meaning wheat). The baguette was introduced by the French during their colonial period. 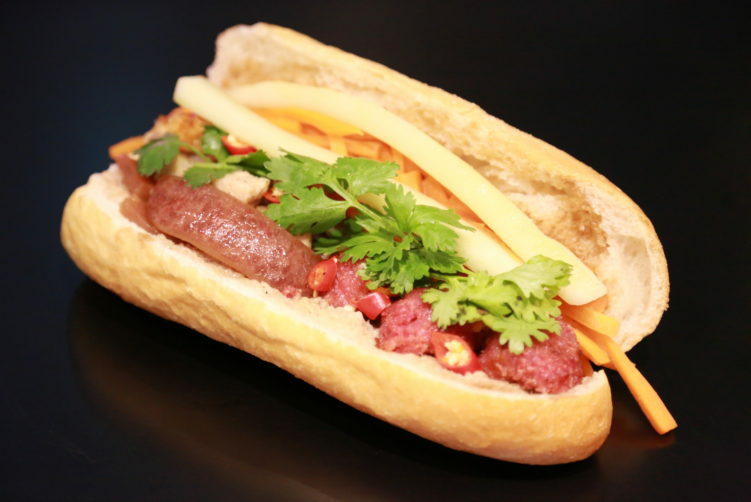 In today’s Vietnam, the baguette is usually more airy than it’s Western counterpart, and also have a thinner crust. Sorry France, but that’s also why I would choose banh mi for the western style baguette ten out of ten times. Unlike the traditional French baguette, the Vietnamese baguette is made with rice flour along with wheat flour. Typical fillings include steamed, pan-roasted or oven-roasted seasoned pork belly, Vietnamese sausage, grilled pork, grilled pork patties, spreadable pork liver pâté, pork floss, grilled chicken, chicken floss, meatballs in tomato sauce, cheese, fried eggs and tofu. Fresh slices of cucumber, cilantro, pickled carrots and daikon in shredded form are the most common vegetables. Common condiments include spicy chili sauce, sliced chilis, mayonnaise, and cheese. Sometimes I just crave for a banh mi. The two most important issues for an excellent banh mi is fresh bread and top quality ingredients, especially when it comes to the protein. You don’t want a poor quality kun chiang (Chinese sausage) with a rubbery texture, a dried out piece of pork belly or meat balls with to much flour in it. And there is no sauce or broth to cover up for you here. In other words, high quality kun chiang, pork belly or meat balls or whatever other protein you choose is the only way. And if the bread isn’t perfect, it ruins everything. It’s by the way baked fresh every morning at Banh Mibo. This time I asked Bo to split my banh mi into to versions, one with kun chiang (Chinese sausage) and one with meat balls. Both excellent. My only regret was, and this is my own fault, ordering my banh mi with fresh chilies as it has a “rawish” and sharp taste that easily can dominate. And don’t get me wrong here, the banh mi was absolutely delicious and the best I’ve had in Bangkok, but I think fried chilies actually would have been a better choice as some of the rawish taste would have been rounded off. 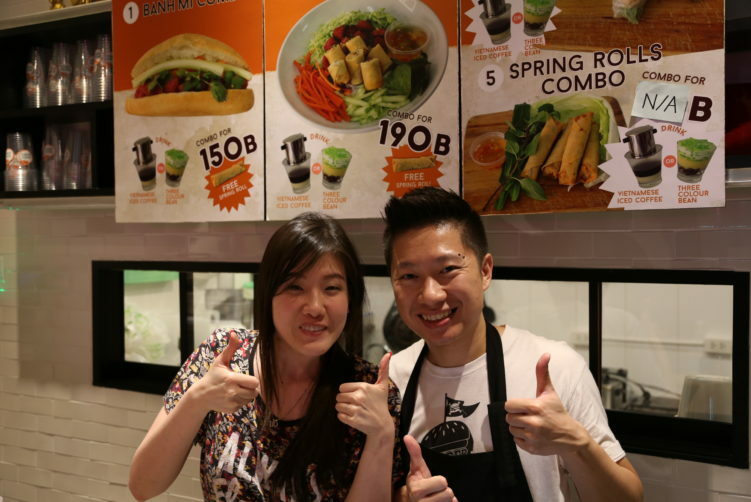 What you get is a really good Banh Mi with fresh ingredients and good service by the welcoming couple Bo and Richie. I have not tried their spring rolls, but I hear they are good, so that will be for my next visit. buy now Food: Banh Mi (crispy roast pork, BBQ pork, Vietnamese grilled pork, lemongrass chicken and tofu ++), spring rolls (fried and fresh). How to get there: Take the BTS to Thong Lor. From there it’s a five minute walk. Banh Mibo was known for driving around in their green Vietnamese sandwhich truck before they now have settled down in 762/2 Sukhumvit Road. What you get is really good Banh Mi with fresh ingredients and good service by the welcoming couple Bo and Richie. See full review at StreetsideBangkok.